How to avoid the “Resolve Link” dialog box when sharing data outside your network. Often the need arises to send our Inventor Data to someone outside our network: to vendors, customers, or even to Synergis and Autodesk support. Autodesk Inventor files are structured in a Parent/Child relationship that must be maintained in order to work with the model in another environment. As assemblies get larger and link to more and more files it becomes very cumbersome to gather all the files needed by the parent file (usually drawings and assemblies). Autodesk Inventor includes a utility called “Pack and Go”. 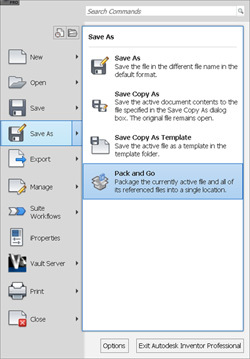 Pack and Go is a utility that will look at the parent file or files and harvest all dependent children needed for that Parent file to open cleanly. This article will guide you through the Pack and Go utility that comes with Inventor. This utility can be found in the following 2 places. Once launched the options are the same. 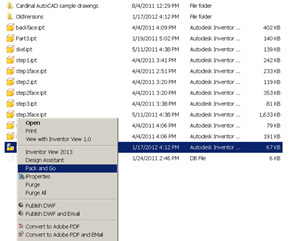 If you right click on any Autodesk Inventor file you will see the Pack and Go option as shown in the image below. From Within Inventor you can also create a pack and go of your current assembly by clicking then select Save As, and then select” Pack and Go” as shown below. Now that you have the Pack and Go dialog opened let’s look at the options. At the top you will see the source file, this is either the file you right clicked on in windows explorer or the active assembly or drawing that was opened in Inventor when you clicked Save As -> Pack and Go. The destination is the folder that Pack and Go will put all the needed files. If selecting the Desktop please create a folder on the desktop first to avoid having a big mess on your desktop. 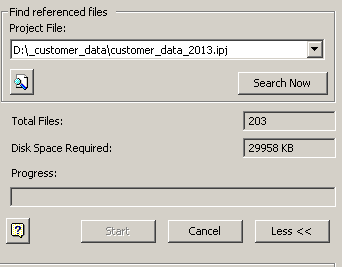 Once you have selected the Destination folder then you will want to set the project file. By default the project file is set to the one current in Inventor. If the file you selected for the Pack and Go is not a part of the scope of this project then you will have to select the correct project file. Pack and Go will not magically fix file resolution issues. Now we need to select all the needed options for the Pack and Go. And in the “other components” folder I have 2 files with the same name but internally are different. Such as “part1.ipt” and “Solid3.ipt”. By copying the files to a single path one of those duplicate files will overwrite the other and ultimately the assembly will be incorrect and you will probably have failing constraints. If you copy with the option “keep folder Hierarchy” an “other components” folder will be created and both files that share the same name will be preserved. 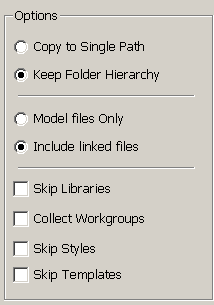 The next option is to include “model files only” or to “Include Linked Files”. Always select include linked files. This will pull any bitmaps, attached .xls files, etc. Always uncheck “skip libraries”. Having this checked will not include any components from a library folder or parts placed from content center. If you use Workgroups be sure to select this option. A workgroup is an additional path outside the project scope that may contain files needed for the assembly. The next two “Skip Styles” and “Skip templates” are optional. Leaving these unchecked will create copies of your templates and design data folders. This is good if you are sending a model to a sub-contractor or you will be working out of your normal connected environment. Once you have all your options set, you can hit the search button. The search will look at the parent file you select and find all needed children of the model. You will see the total number of files and the disk space required for the Pack and Go. Finally select” start”. When the process is finished the “done” button will be lit. That is it!! You can now zip the folder you created and send it to anyone you like. You will notice that a modified copy of the project file is included. If you want to test your pack and go, simply open Inventor, select the project file in the folder that was created and open the model. can i get the drawings of the sub parts of the assembly with pack and go option???? To get all referenced files, click the more button in the lower right corner of the dialog. Then select search project file locations or choose a folder that may contain the drawings. Finally click search now. The displayed results should be any related files of the assembly or the assembly’s children files. Can I Pack and Go just the specific Level of Detail within the assembly ? Thanks.